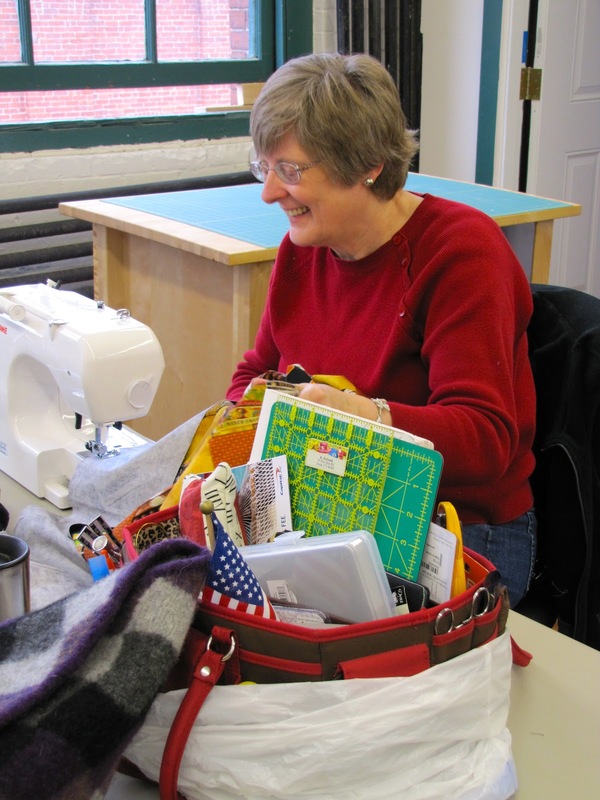 Yesterday, we had Sit and Sew Saturday at the studio. Love these days as there is such inspiration. Fran brought in this lovely scrappy Courthouse Steps to work on... I can't tell you that this photo does not do this justice. 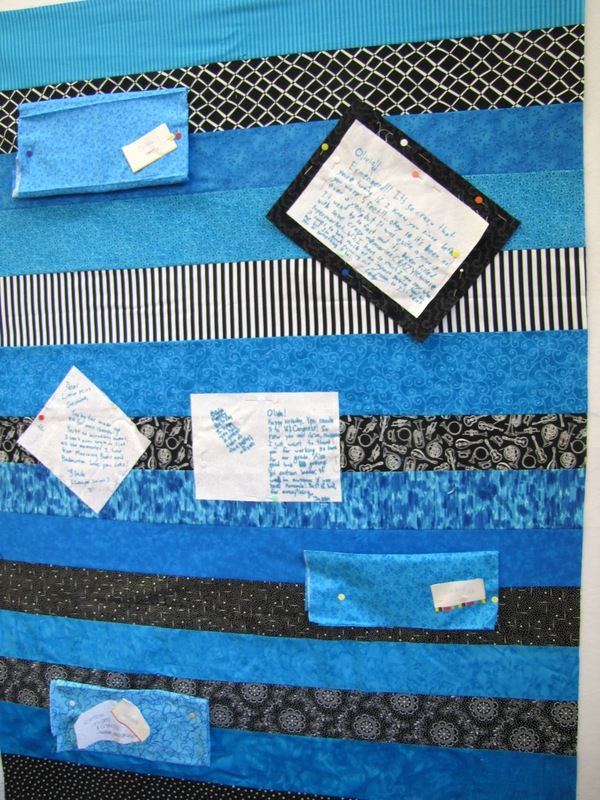 She had this stored away for YEARS and decided to break it out and finish it, it is going to be a beauty and will be in the Flights and Fantasies Quilt Show in September!! Find out more about the show by clicking here. Anne brought in these little pouches that she made and was selling... ADORABLE!! Justine was working on this Sweet 16 Signature quilt for her granddaughter. 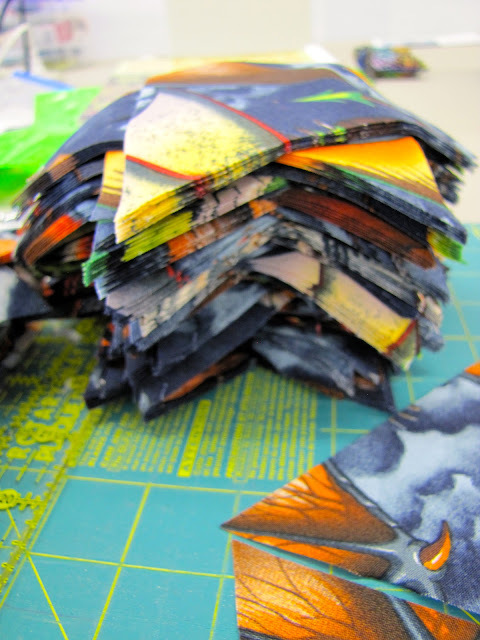 Sally brought in these stacks of triangles to work on a One Block Wonder. Show and tell from Kathy... gorgeous! Nancy working on her Cactus Flower table runner. Find the pattern here. WOW... Look at Sally's One Block Wonder... A.M.A.Z.I.N.G.!! There is Sally doing her best Wilson pose. 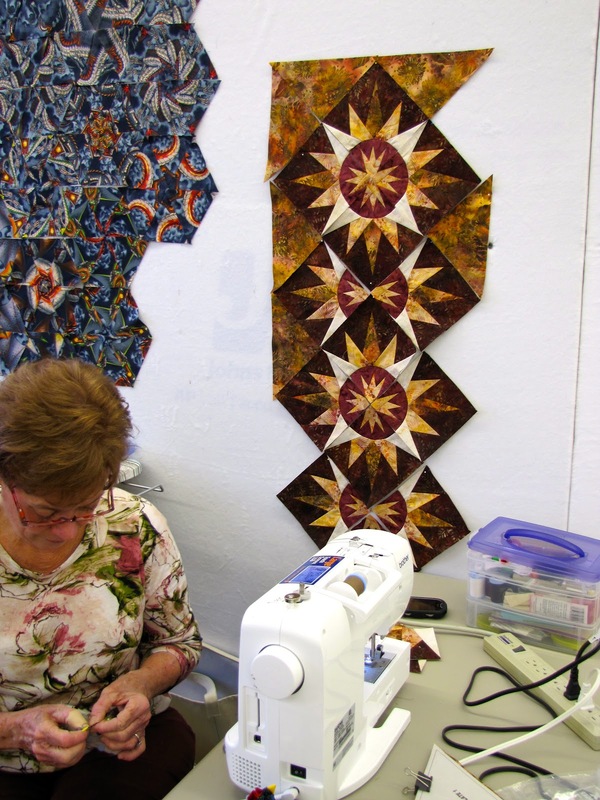 Kathy is a happy quilter. There is always time for socialization! 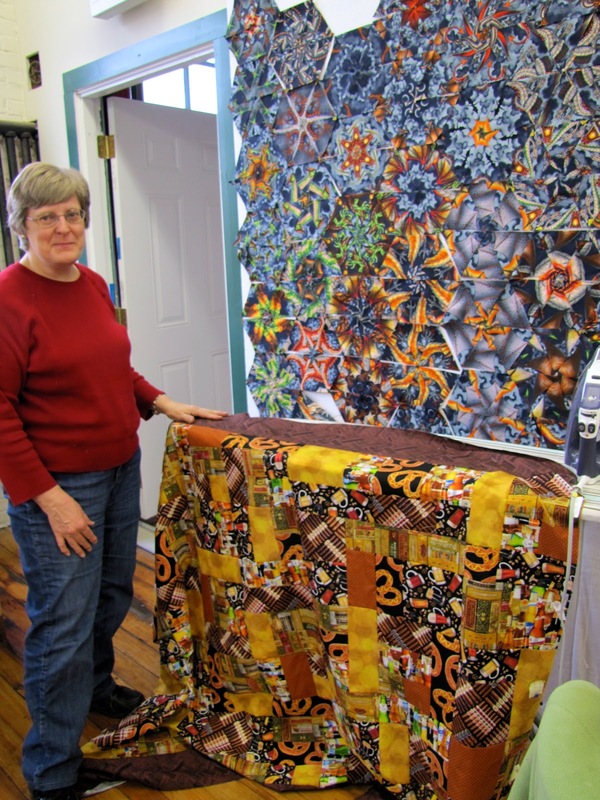 Kathy posing with her Man Cave Quilt in front of the One Block Wonder... a busy little corner. Little mini one block wonders! 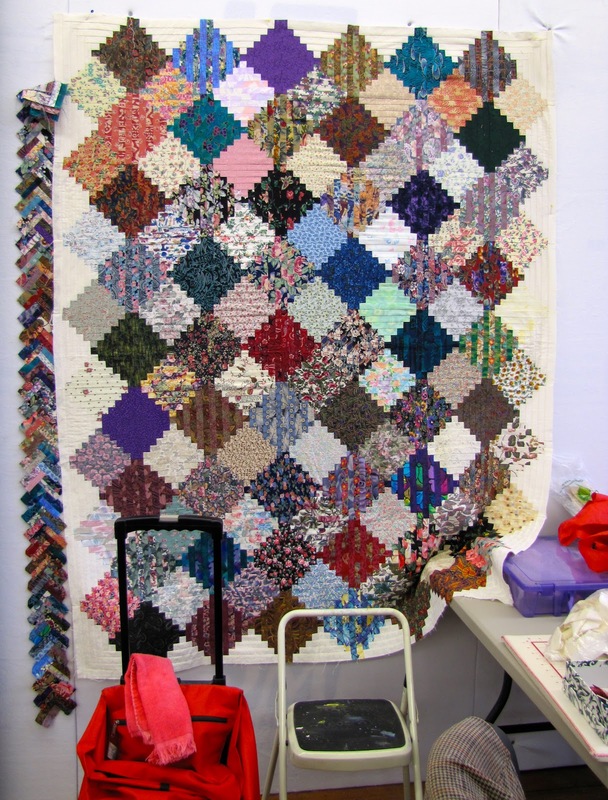 My Indian Summer quilt is growing. The pattern can be found here. Sally's neatly stacked wonders to take home and join together. Believe it or not, I also had the Glacier Star class going on at the same time. Photos from my students tomorrow!